Probably the last thing New Yorkers think about as they wend their way to and from work is the idea that they live on islands. The mainlanders, those inhabitants of The Bronx, have as a consolation prize the City Island waterfront. Despite being surrounded by water, access to the rivers and the harbor has been for years pretty difficult for New Yorkers. This is changing with small but for the most part rustic outlets with access for kayaks, sketchy docks to get to boats on moorings or very bouncy slips on the wildly unprotected Hudson River. In the past couple of years, Brooklyn has been involved in the development of a very pleasant gateway to water access on the East River. One°15 Brooklyn Marina, just south of the Brooklyn Bridge and part of Brooklyn Bridge Park, exemplifies the kind of serendipity that happens when several like minds all bump into each other. Combine equal parts of Tim O’Brien, sailor and former manager at North Cove, a Singapore-based conglomerate with a division specializing in marina development, an American company specializing in ‘green’ marinas (and responsible for the facility’s innovative wave deflectors), the residents and Borough Burghers of Brooklyn, some dilapidated waterfront property, some local marine-oriented non-profits, lots of energy and patience and presto – water access and so much more. Comprising many aspects of Tim O’Brien’s vision, One°15 Brooklyn Marina is in equal parts town dock, sailing club, sailing school, youth sailing site and marina. The complex includes slip rentals for local boat owners tired of the one- or two-hour drive to get to their boats, docks suitable for yachts up to 250 feet, racing for the Wednesday Warriors (and other nights, too) on the fleet of J/80s and Melges 24s, public access to the water to stroll or just sit and gaze, kayak storage, and space for a project dear to my heart. Brooklyn Boatworks is a non-profit that works with local kids who firstly build Optimist dinghies in plywood and then launch them so they can sail around in a part of the marina. The skills and disciplines kids are exposed to, and the fun they can have doing such things, is almost endless and all positive. One°15 Brooklyn Marina is celebrating its grand opening in grand style by hosting two international yacht racing events. Another aspect of this fascinating complex is their hosting two major international professional sailing events in 2016. This is something not seen in New York Harbor for perhaps a hundred years. The legendary Transat Race, THE single-handed transatlantic race and The Atlantic Cup, the only dedicated regatta for the Class 40s in the US, will both be staged in the marina this month. The Transat (now known as the Transat bakerly thanks to a partnership with a new brand of French-inspired bakery goods) is to finish in New York for the first time in over 50 years. Originally proposed as a lark by Blondie Hasler, a British Colonel decorated during the Second World War, the first race was in 1960 and finished off Ambrose Tower. Hasler was the second to finish of the five-boat fleet. The first and several subsequent races were sponsored by the Observer newspaper and known universally as the Observer Singlehanded Trans-Atlantic Race, thus OSTAR. The Transat bakerly is the commercial and professional spin-off of the original race, and is focused exclusively on the professional and semi-professional solo scene. The race named the OSTAR has retained its more Corinthian, everyman composure and is held on a four-year cycle in odd years, with the next edition finishing in Newport, RI in 2017. The Transat bakerly may be little known in the US, at least outside of Newport, site of the OSTAR finish since 1964. Professional sailing lives of course on the return on investment for the sponsors and so for this race, New York offers just a bit more media coverage and corporate hospitality opportunities than Newport. The open public access aspect of the marina will allow, encourage even, visitors to get up close and personal with the very sharpest of the leading edge boats in the world…yes, equal to the AC boats. If there is any doubt of the skills of these sailors, consider sailing a monstrous 130 foot-trimaran across the North Atlantic, upwind, alone, in May…and regardless of your opinions of the of the skippers (Americans being almost universally dubious of the mental health of single handed ocean racing sailors), they are without question among the finest seaman on the oceans. 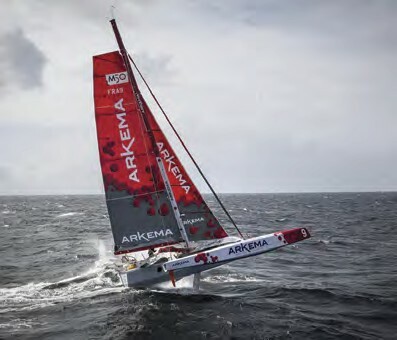 The present entry list comprises a virtual who’s who of solo ocean racing. In the you gotta be kiddin’ department are at least two of the Ultimes, trimarans over 100 feet long capable of speeds close to 50 knots. Alongside (albeit only at the dock) are the IMOCA 60s, the fire breathing grandchildren of Chichester, Hasler, Tabarly and the other icons of solo racing. There is a class of a few 50-foot multihulls, but the most popular ride is the Class40s. These forty-footers are the same general idea as the 60s – fast, fun, and offshore reliable, but more the four-cylinder turbo’ed versions suitable for amateur operation than the Le Mans IMOCA 60s. Within the eleven entries in the popular 40-foot class are the three women skippers in the race. Anna-Maria Renken is German and is sponsored by Nivea, a name well known to US consumers. With only three transatlantic races (by other names) under her foulies, she is a relative novice at the game. Isabelle Joschke, a French/German sailor representing the Generali Insurance/Finance group, a billion-Euro French-Italian company, is a tad more experienced, including sailing in the Mini Transat Race, held in 21 footers. The lone Englishwoman in the fleet, Miranda Merron, is de facto French, having lived in France for ages as far as I can tell. I think she would forgive me for mentioning this, but at 47 she is by far one of the most experienced solo sailors of either gender. Quick, name a serious professional female athlete, one who plays in the very physical game of solo offshore sailing…at 47. Part of the festivities surrounding the arrival of the boats will be tours of the boats and meet & greets with the skippers for the local kids. Imagine for a moment if you will, these three ladies arriving in New York after 20 days at sea alone, in harsh conditions. After a kip, a shower and a meal – not freeze dried – these remarkable people will be available for local kids to see and talk with. Consider an immigrant kid, perhaps a 10-year-old girl transplanted to New York from some war-torn dustbowl, thrust into the bustle of Brooklyn and now communing with these women aboard a ‘thing’ that might as well be the spaceship from Close Encounters of the Third Kind. Can it not be possible that such an experience might be the spark that kindles who knows what fire in the belly of said young woman? To see, hear and speak with someone who has had all these amazing adventures and will, I have no doubt, be inspiring, gracious, helpful and encouraging to these young people is an experience so few kids get the opportunity to have. What chance they have a totally different approach to building their Opti next year? The Transat bakerly starts on May 2 in Plymouth, England. The Ultimes may well be here within the week. The IMOCA 60s and the Multi50 tris will be in next. The 40s, being only 40 feet, will be the back markers arriving around the third week of May. And so, on to the second professional sailing event in Brooklyn. Sailors and sailing fans are cordially invited to a celebration of The Transat bakerly at Fornino Pizza in Brooklyn, NY on Friday, May 20. This party includes the prize ceremony for the IMOCA 60 and Multi50 classes, and it’s a fundraiser for SailAhead, a New-York-based non-profit organization dedicated to healing wounded military veterans through sailing. The celebration is part of Brittany Day on the Pier, which will be held at Pier 6 in the Brooklyn Bridge Park Greenway. The event is hosted by BZH New York, a non-profit association of Bretons and friends of Brittany dedicated to promoting the culture, economy, tourism and language of the Brittany region of France and fostering a relationship between Brittany and New York. Brittany Day on the Pier runs from 10 am to 11 pm. For more details, visit bzh-ny.org. The Atlantic Cup presented by 11th Hour Racing is unique in several ways. As a stand-alone regatta for Class40s, it’s the only such event of its kind in the US. It is also, as far as I know, the only event where the organizing authority is not a yacht club or similar member-centric organization but rather a professional sports management company. The event also has a full commitment to environmental sustainability – biodiesel, solar panels, no trash/discharge, education, and so on. This sustainability is parallel to the One°15 Brooklyn Marina approach. Part of the design brief included ‘see-thru’ panels on the docks so sunlight can get to the water and reduce the development of nasty things in the water. New York City is renowned for many things, including the innovative and quirky. One°15 Brooklyn Marina certainly fills the innovative, as does The Atlantic Cup. Quirky? Well, that’s very consistent with the founder and participants of the first OSTAR and has not diminished over time. I think it is very possible New Yorkers will take The Transat bakerly and The Atlantic Cup all in their stride. After all, they mostly live on islands are known to have their own quirky moments, too. Australian born, Joe ‘Coop’ Cooper stayed in the US after the 1980 America’s Cup where he was the boat captain and sailed as Grinder/Sewer-man on Australia. His whole career has focused on sailing, especially the short-handed aspects of it. He lives in Middletown, RI where he coaches, consults and writes on his blog, joecoopersailing.com, when not paying attention to his wife, teenage son, dog, two cats and several, mainly small, boats. Prof. maintained. Approx. $25,000 in recent upgrades. B&G 4G broadband radar; B&G Zeus 12" plotter with sailing features; Auto Pilot; Standard Horizon Matrix VHF, AIS, DSC, GPS; Solar Panel fully charges batteries; Xantex Inverter/Charger; 6 speaker Fusion Stereo AM/FM/Bluetooth; new holding tank, hoses, and macerater; new fuel tank; new glass in windows & hatches; new cabin sole; dripless propshaft; feathering prop; MackPack lazy jack system with fast track; solar & cowl vents; etc., etc.